This session is targeted towards native (C++) developers. The next version of Windows Mobile will have a radical new look, with lots of new common controls and UI capabilities. This session helps you understand what you can do today to minimize backward compatibility issues. We also share many tips and best practices for improving the usability and overall quality of your mobile applications. Introducing concurrency into native Visual C++ applications has long been the domain of true experts and gurus. Yet, as the hardware industry shifts toward multi-core and manycore processors, all developers will need to be able to write robust and scalable parallel applications. As part of its work on Visual C++ and Visual Studio, the Parallel Computing Platform team is building a key set of technologies that will enable the development of such applications. In this talk, we explore libraries for expressing concurrency, a set of messaging APIs that allow developers to consistently build parallel applications that are robust and resilient, and a shared user mode runtime for scheduling and for coordinating system resources. Come learn about these exciting new technologies that will help bring concurrency to the masses. Visual C++ 2008 is packed full of changes for those who prefer the C++ language syntax and power. This session covers STL/CLR, the new extensible marshalling library, and changes coming in the C++ standard, specifically TR1. If templates don’t scare you, Boost has intrigued you, and you’re the one everyone turns to for mixing managed and native code, this session is for you. But there are others, they just don't have C++ in the session title. Harness the power of the 2008 IDE using new tips and tricks used by top Microsoft MVP developers and Microsoft employees. We look at new keyboard shortcuts, new options, the powerful "Quick Command" system, macros, tweaking IDE performance, and more that will make any developer using Visual Studio instantly more productive. The entire session is hands-on inside the IDE and applicable to any language, including Microsoft Visual Basic, Visual C#, and Visual C++. If you've been using Microsoft Visual Studio 2005 or have never touched Visual Studio, you're guaranteed to walk away a VS power user. Yes, legacy (MFC/Win32) applications can interoperate with a Windows Presentation Foundation (WPF) user interface. Companies that have large Microsoft Visual C++ codebases can modernize their legacy applications by giving them a contemporary user interface. They can do this without having to rewrite the core of their codebase. This talk presents "best practices" for how to modify an application so that the native code operates correctly with a new WPF-based managed user interface. The talk covers such questions as "Can MFC applications move to use WPF," "Does it make more sense to rewrite or upgrade the UI," and "How do you design an interop solution between MFC/Win32 and WPF?” As the talk unfolds, it includes a number of "do's" as well as "don'ts." This session demonstrates the new features added to MFC in Visual Studio 2008, including support for Windows Vista Common Dialogs, Vista Common Controls, the 2007 Microsoft Office system look and feel (including support for an Office Ribbon-style interface), Office and Visual Studio-style Docking Toolbars and Tabbed Documents. If you're here and you missed one of these, grab the slides on CommNet and see if you can find the speakers on site. If you didn't come to Tech Ed this year, consider ordering the DVD of all the sessions. 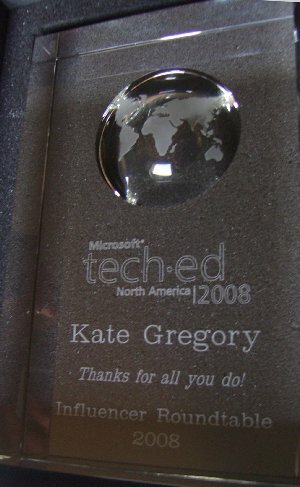 On Tuesday, Day 1 of TechEd, I was lucky enough to join a small group of people for lunch with Bill Gates. While spending an hour or two with Bill would be an honour at any time, to do so at his last Tech Ed was extra special. The invitees spanned a wide range of the developer spectrum, and what we had in common was our contributions to community. There were Regional Directors, MVPs, MCTs, INETA people, and so on. Bill arrived just in time for a group photo (I'll post it when I get it) and then sat down to answer questions for an hour or more. I was so impressed; more impressed than I planned to be. I found his answers really illuminating and inspiring. Our geeky minds and way of approaching problems can be turned to far more than just designing software. Why not, if you don't have to worry about covering your mortgage payment, try fixing the problems of disease, education, agriculture, and even the United Nations? It's going on the "bookshelf of showing off" for sure, but the inspiration and the practical information are more to me than the crystal . Update: Fellow attendees Andrew Brust, Matthew Roche, Daniel Egan, Scott Golightly, Stephen Forte, and Neil Roodyn have blogged their impressions also. So has Soma, who graciously welcomed us all to the lunch and is well known as a friend of developer community people.